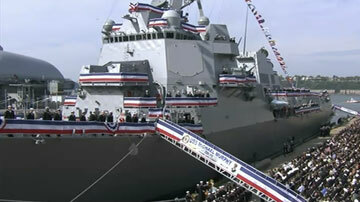 This past Saturday, the U.S. Navy put into commission its newest guided missile destroyer, the USS Michael Murphy. In case you don't know his story, he was immortalized in the best-selling book Lone Survivor, the account of Seal Team 10 and Operation Redwing. According to the official statement by the Department of Defense, "The ship honors Navy SEAL Lt. Michael Murphy, who was posthumously awarded the Medal of Honor for actions in Afghanistan. He was killed by enemy forces during a reconnaissance mission, Operation Red Wing, June 28, 2005, while leading a four-man team tasked with finding a key Taliban leader in the mountainous terrain near Asadabad, Afghanistan. The team came under fire from a much larger enemy force with superior tactical position. Murphy knowingly left his position of cover to get a clear signal in order to communicate with his headquarters and was mortally wounded while exposing himself to enemy fire. While continuing to shoot, and being shot at, Murphy provided his unit's location and requested immediate support for his element. He returned to his cover position to continue the fight until finally succumbing to his wounds." HERO is not a big enough word for the valiant actions and sacrifice of this man. While the Medal of Honor is the United States of America's highest military honor, the Navy bestowed its own honor of equal significance. 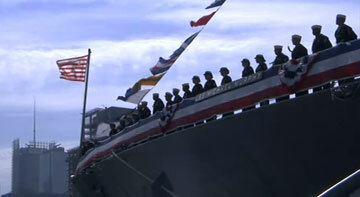 It is only fitting that the motto of the USS Michael Murphy is "Lead the Fight." From all the personal and professional testimonies offered at the commissioning of this ship, we received a portrait of a young man that was nicknamed "the Protector" during his growing-up years, for his unwavering defense of those being criticized or unfairly treated. In his final moments, he maintained that protective mindset, sacrificing his life to save his teammates. He truly "led the fight." One of his favorite books was Stephen Pressfield's Gates of Fire, the epic story of 300 Spartan soldiers battling a two-million strong Persian army. The author captures the spirit of such warriors like Lt. Murphy with this statement: "When a warrior fights not for himself, but for his brothers, when his most passionately sought goal is neither glory nor his own life's preservation, but to spend his substance for them, his comrades, not to abandon them, not to prove unworthy of them, then his heart truly has achieved contempt for death, and with that he transcends himself and his actions touch the sublime....". It's as if Stephen Pressfield wrote those words with Michael Murphy in mind. And these same sentiments were echoed by those that spoke on this grand occasion. The Commander of the U.S. Special Operations Command, Bill McRaven said, "Michael Murphy represents all that is good about our Special Operations Warriors, and he earned the greatest compliment one Navy Seal could give to another .... Teammate. That word represents the bond among those who wear the trident, and it is the driving force behind everything they train for; it's unconditional and unending. They are committed to be battle-ready at all times; to bond together and go forth to protect their country. That's what Michael Murphy's life was about --- serving others and protecting others. His spirit will live on in this ship." 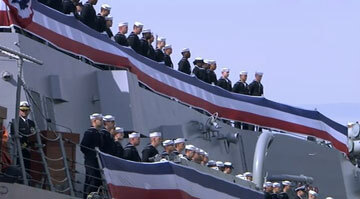 That sentiment was echoed by Jeffrey Geiger, the President of Bath Iron Works, the builder of the USS Michael Murphy. "The strength and spirit of Michael Murphy run deep in every plank and deck plate of this ship. Building this ship was a personal endeavor for us, and we were proud to do it. In this ship, you have 509 feet of American power." 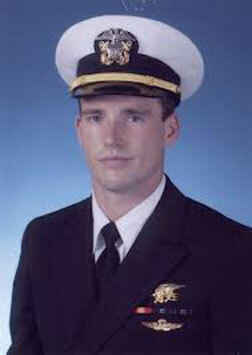 But I think it was the Commander of the USS Michael Murphy that expressed the essence of both the ship and the hero. "This ship is different," he said. "We take our mission from the story of Lt. Michael Murphy and Operation Red Wing, and the 18 others who lost their lives with him on that day. There was no hesitation; they were going. This ship is different: We take our inspiration from the families and friends of these heroes. They give us the strength we did not have. This ship is different: We take our commitment from the Builders and the 290 Officers and Sailors who serve as Crew of this Destroyer. 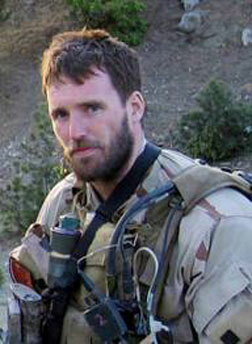 We will continue to uphold the legacy of Michael Murphy and his teammates... This ship is different." With that promise, the Naval band played "Anchors Aweigh" as the crew ran up the gangplank to take their places on board the ship. What a magnificent sight! But I cannot end this post without a reminder that Lt. Murphy was not the only one that died that day. And even though I never met him, the affirmations spoken about his character on this special day, lead me to believe he would not want any tribute to be about him. He would want us to honor the lives of those who died with him on that mountain in Afghanistan, along with the lives lost in the rescue mission that he called in. On that fateful day in 2005, nineteen of our bravest warriors died, and their heroism is represented by the commissioning of this greatest of American warships. We need to know their names and recognize their sacrifice: Michael Murphy, Matthew Axelson, Danny Dietz, Jacques Fontan, Daniel Healy, Erik Kristensen, Jeffery Lucas, Michael McGreevy, James Suh, Jeffrey Taylor, Shane Patton (all Navy SEALS); and Shamus Goare, Corey Goodnature, Kip Jacoby, Marcus Muralles, James Ponder, Stephen Reich, Michael Russell, and Chris Scherkenback (all members of the 160th Special Operations Aviation Regiment - the famed Night Stalkers). Ray Mavis, the Secretary of the Navy, summed the ceremony up best, "As you consider Michael Murphy, and this ship, his namesake, you know that American Exceptionalism, in all its forms, will not only survive, but prevail." And when I looked upon the American flag whipping in the wind, I knew he was right. So it is with a humble and reverent heart, that I join America in wishing the crew of the USS Michael Murphy this nautical blessing .... "Fair Winds and a Following Sea." Long live the spirit of Michael Murphy! John 15:13 "Greater love has no man than this: to lay down one’s life for one’s friends." Great post. Thank you. Brought a tear to my eye. Many of these brave men were from my "neck of the woods." Their loss was felt hugely in our community. Thanks for a very nice write-up and an excellent tribute. May this powerful ship, the superb crew who sails it, and the dedication embodied in its name continue to defend out nation. It was an honor to write about him. I know his story very well, and have actually met Marcus Luttrell a couple of times. Being an ordinary citizen, there is no way that I can let these guys know how much we appreciate them and their sacrifice, so this was my humble effort. I am so grateful that there are men like him! He is the best of America!